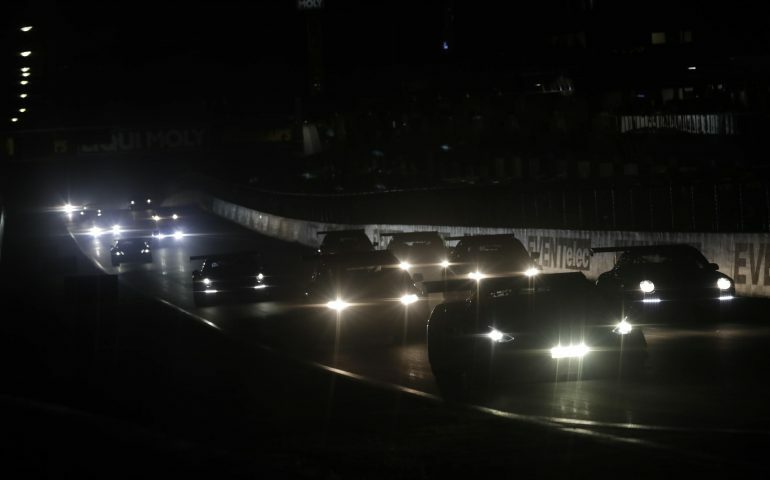 The 2017 Liqui-Moly Bathurst 12 Hour kicked-off under the cover of darkness at 5.45am this morning and already, has delivered plenty of action for race fans. With three hours of the race around the clock now almost complete, the #88 Maranello Motorsport Ferrari leads the field outright and from the #22 Mercedes-AMG Team STM/HTP Motorsport Mercedes. Class leaders are the #5 GT Motorsport Audi (Rydges Bathurst GT3 AM), the #12 Competition Motorsports powered by Ice Break Porsche (BRM Watches GT3 Pro-AM), (Liqui-Moly GT3 Pro-Pro), the #21 Nissan Motorsport GTR (myPlates Class B GT3), the #19 PROsport Performance Porsche (Avis Class C) and the #93MARC Cars Australia Focus V8 (Racer Industries Class I). It was a very controlled start from the field for a trouble free lap one. The #1 Tekno Autosports McLaren started from the pit lane after an overnight engine change while the #28 On Track Motorsport/GWS Personnel BMW 335i missed the start completely due to issues. In the first ten minutes, the drama started. Maxime Soulet in the #8 Bentley Team M-Sport Continental found himself in the fence after a right rear puncture, the #14 IKAD Engineering Porsche 977 Cup Car with Peter Major at the wheel stopped at turn 13 before limping back to pit lane on three wheels, and the #23 Nissan Motorsport GTR was into the pits early with gearbox issues. The Nissan team would later taking advantage of a safety car to undertake more extensive work. That first safety car came at 6.04am when the #74 Jamec Pem Audi spun and stopped diagonally facing the wrong way across the road at the Sparesbox Dipper. There were multiple near misses as cars tried to avoid, with Chris Pither in the #38 Hobson Motorsport Nissan GTR squeezing through on the wrong side for contact with the wall and the #74. It would limp back to the pits for an extensive visit, not returning to the track until 7.02am. As the yellow flags flew, it was Tony Vilander in the #88 Maranello Motorsport Ferrari who was leading the field from the #90 Castrol MARC Cars Australia BMW M6 of Chaz Mostert – but that wasn’t to remain the case for long. Following the 6.30am resumption, our first lead change was actioned with Mostert taking the lead on lap 14. With the sun rising, it was time for a flurry of fast laps, with Mostert and Vilander trading fast lap after fast lap as they battled for the lead. In the end, it was Vilander who would hold the quickest lap (2m 02.908s) but not the lead. Mostert’s position was solidified when the #88 and the #41 Brookspeed Porsche Cayman GT4 Clubsport were served with drive through penalties for weaving on the restart. As the second hour got underway, last year’s winner – the #1 Tekno Autosport McLaren – found itself in strife, slowing on the track at turn two before appearing to reboot the car. Rob Bell limped the car at the pits at the chagrin of the team due to the risk of the back of the car being burnt down. He did make it back in one piece and after the laptop was plugged in to allow the engineers to change some settings, was able to rejoin. At the same time, the #94 MARC Cars Australia Mazda 3 V8 was having an off track excursion at the Virgin Australia corner, with Tim Leahey then being forced to limp the car around the entire circuit to get back to pit lane for attention. As the one and a half hour mark was approached, Mostert pitted the #90 from the lead under green conditions, just moments before the second safety car was called to the benefit of the rest of the front runners who were able to conduct their stops under SC. The yellows this time flew for the #4 Grove Hire Porsche of Alexandre Imperatori who was in the wall at Reid Park. “(Starting in the dark) was pretty awesome. That Ferrari is pretty quick out there, I was just trying to tag onto his tail and then on the restart it looked like he didn’t have enough heat in his tyres so I pounced on it,” Mostert said. The restart was made at 7.24am after 36 laps had been completed, with Earl Bamber leading the field in the #911 Walkinshaw GT3 Porsche 911 from the #24 Nissan Motorsport Nissan GT-R. Previous race leader and pole sitter, the #88, was third despite its earlier drive-through, while the #37 Darrell Lea Keltic Racing McLaren was fourth. Rounding out the top five was the #22Mercedes AMG Team STM/HTP Motorsport Mercedes. Twenty minutes later and in a flurry of activity, it was time for disaster for the #90 – the entry tagged the wall over the top of the Mountain and on return to pit lane, was pushed back into the garage with suspension damage for a long repair. At 8.30am, it would return with replaced wishbones. The #50 Synep Racing Porsche also found the wall at the Audi Cutting but was able to get back underway, while there was contact in the Caltex Chase between the #47 Kiwi Racing Lamborghini and the #37, with the #37 making contact while trying to avoid the ‘self spinning’ #47 – incurring a puncture as a result for a trip to pit lane. As the clock approached 8.00am, the first official during-race withdrawal was announced, with the #911 Walkinshaw GT3 Porsche withdrawn with a broken steering rack. The #22 Mercedes took over the lead at 8.12am when the #24 pitted from the lead, before the third safety car for the race was called at 8.27am for a stranded #47 after contact with the #54 Donut King MARC Cars Australia Focus V8. As the three hour mark ticks over, the restart was imminent following plenty of cars pitting under safety car to deliver the restart order.